Student Days occurred at ProMat 2017 from April 5-6. The event allowed for academia and industry professionals to engage in real-world discussions about the technologies and the skill sets required for future influencers within the supply chain, material handling and logistics industry. There were over 200 students and faculty from high schools, community colleges, universities, and trade schools that attended. See event highlights below! For the 14th consecutive year, the College Industry Council on Material Handling Education sponsored the popular Classroom Day. 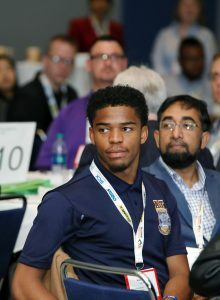 This day provided students with the opportunity to visit the show floor and meet with exhibitors on guided tours, led by experts in their field. Both students and instructors came away with a real world understanding of the products, services and technologies that enable the supply chain. 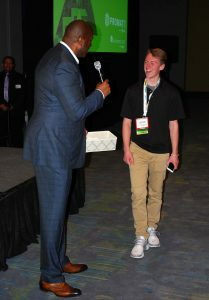 Earvin “Magic” Johnson made a special appearance and became the highlight of Student Days. The NBA legend and Chairman and CEO of Magic Johnson Enterprises inspired the students by encouraging them to follow their passion. 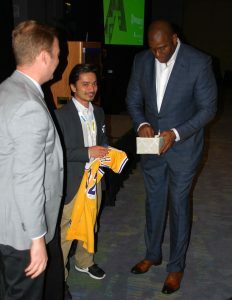 Prakash Jamar Kattel, a student from Ohio University won an autographed Magic Johnson jersey while Gavin Peterson, a high school student from Millard Public Schools and Nigel Hammett from North Carolina A&T were selected to take a trip to Los Angeles to spend a day shadowing Magic Johnson. Student days concluded with Industry Tours. Students traveled from McCormick Place to Lagunitas Brewery to learn about state-of-the-art technologies. Interested in attending student days in the future? Mark you calendars for MODEX Show coming April 2018 and contact Angela Jenkins, ajenkins@mhi.org or 704-676-1190 for more information.